The U.S. Forest Service is investigating Nestlé for using permits that expired in 1988 to take water out of a national forest to be used as bottled water. Nestlé has been drawing water from Strawberry Canyon in the San Bernardino National Forest in California (in the 4th year of the state's drought). A pipeline takes that water through the forest to a site where it is later bottled as Arrowhead spring water. The Forest Service, it should be added, has been asleep at the switch for 27 years. Apologies? Voluntary restitution? Not on your life. Nestlé says its "total water use in California last year (705 million gallons) is no more than the amount of water used to irrigate just two golf courses." A mere sip. "Bottled water is such a small user that to focus on our industry as a material concern in water policy debates is misguided." When you see the Nestlé label on a product in your grocery store, please think twice before adding it to your cart. Joy Harjo is of Native American and Canadian ancestry. She is influenced by her Muskogee Creek heritage, as well as her feminist and social concerns. She is a musician—a fine saxophonist—as well as a poet. This poem, this song reflecting on the character of prayer is a beautiful expression of the capacity of prayer "to open your whole self" to the whole voice within. To see eagle that morning over Salt River is itself prayer, a capacious mindfulness, awareness of the known and mysterious relationship of inner and outer, of ourselves and the natural world which is both our surround and our identity. And kindness in all things." At its most capacious, prayer not as petition but as expression of the fullness of consciousness, of our blessedness, does indeed sweep "our hearts clean with sacred wings." When truly alive we need not seek it but experience it in our daily lives. This conversation took place on March 21, 2015 at John’s home in Mill Valley, California. John, who was the person that most influenced you? There isn’t any doubt that it was my grandmother, my mother’s mother Eleanor Roosevelt. We grandchildren called her Grandmère—she learned French before she learned English. She was such a gifted person. She let me absorb who was and what she treasured. I think I learned my basic values from her — for example, her attachment to her family, her devotion to human rights; her absorption with the United Nations; her affection for Israel. What are your early memories of her? I was very young, but I still remember Grandmère getting off an airplane in Seattle and coming to stay with us on Mercer Island. Later, while I was still a young child, my mother and I moved to the White House during WWII, but I hardly remember her from that time because she was gone so much—overseas, visiting bases in the Pacific, London or elsewhere. My memories of her are more vivid from the years I was a student at Amherst College. My parents had gone to Iran for two or three years, so she said, as was her way, “Johnny, if you don’t have a home to go home to, you have mine. Come to New York City or to Hyde Park, wherever I am. And I did. What do you remember of those times? There are so many memories…like when John Kennedy won the presidency from Richard Nixon and we watched it on television at her apartment on East 83rd Street, and when JFK visited her at her home in Hyde Park. There were two houses on her parcel of land on the estate at Hyde Park. The family home, Springwood, we called The Big House, Her home, called Val-Kill, was named for the stream that meanders through the land. Her home at Val-kill was actually constructed as a small furniture factory that produced amazing reproductions of traditional American furniture. It was my grandmother’s way of employing a few local craftsmen that would not otherwise have had work. I can tell you she was sometimes a perilous driver. Her son, Franklin, Jr. owned Fiat dealerships in the Southeast—one of his many enterprises—and gave her a little Fiat sports car. She would talk animatedly while driving. At the end of her driveway onto Route 9G, for example, she would stop, look both ways, and continue talking, sometimes for a minute or more. Then she would take off without looking again. But to my knowledge, she never ran into anyone. Talk a bit about your grandmother’s involvement in the United Nations. President Truman appointed her as a member of the American delegation to the United Nations. She was naturally drawn to the realm of human rights. More than any other single person, I think, she was responsible for the creation of the Universal Declaration of Human Rights. The only standing ovation that the General Assembly has ever offered anyone was for her when she presented the Declaration, and it was unanimously approved. Creation of the Declaration was very difficult process, given especially the U.S. relationship with the Soviet Union. But she managed to pilot it through to a unanimous conclusion. It was an astonishing act of creativity and political acumen. My recollection is that in the late 1950s she was nominated for the Nobel Peace Prize. If only for that single accomplishment, she deserved it. Did you travel with her during the time she was working for the UN? I was too young to have been there when she was working on the Declaration, which was adopted in 1948. But later in the Truman years and when Eisenhower and Kennedy were presidents. By then she was no longer an official member of the UN delegation, but a strong advocate. I traveled with her in the U.S. and in Europe. She had amazing energy. I recall a trip in which my cousin, Haven Roosevelt, and I, as teenagers, were traveling with her. At around 5 o’clock we would stagger into our hotel room ready to hit the hay and she would say, “Now, children, remember we have a dinner with the mayor.” There was still a whole evening in front of us! I couldn’t believe the energy she brought to the whole of her life, almost to the very end. It was wonderful. One of the secrets to her energy was her mastery of the power nap. When she and I both served as members of the Board of the American Association of United Nations, I as student representative, I would sometimes sit across the table from her at meetings. She would nod her head slightly and close her eyes for a minute or two as if she were thinking carefully about what was going on. To the members at the table, she never missed a beat. I don’t think anyone but me knew she was napping. You must have met some intriguing people. One of the encounters I remember best was when I was in Berlin at a conference of the International Students Association of the UN. My grandmother was elsewhere in Europe. I got a telephone call from her saying I must come to Brussels the next day, when she would be having lunch with Harry Belafonte. I had no idea even how to get to the airport, which was in East Berlin. But she said, “You must come!” It was a command performance. I had a few German marks in my pocket and nearly was arrested by the East German police for inadvertently taking currency out the country, which was illegal. Luckily, a man behind me in line spoke German and defended my innocence. He saved me from jail. We boarded an American DC-3, left over from the war and salvaged by the Poles. It was decorated it in a kind of Victorian style, with very plush seats and a tasseled interior. It was very foggy as we approached the airport in Brussels. The plane would descend, as if landing, and then suddenly and sharply rise again. This happened again and again. We were so low that I could I see telephone poles flashing by. The pilot had no radar and was looking for the runway! But I got there in time for lunch with Harry Belafonte, and I’m glad I did because I liked him a lot. My grandmother and I were together for the remainder of that trip. Could she have imagined the role the UN would play today? The role the UN is playing today is diverse, and less vigorous than she would have wished. My grandfather’s vision for the UN—and my grandmother’s nourishment of it—was that it would become principally an instrument for maintaining peace. But I think she had a sense that the UN was not going to be as central an organization as she and my grandfather had hoped. She would be disappointed, but I believe she would still be proud of it, and certainly working on its behalf if she were alive today. There’s a famous photograph of Mrs. Roosevelt walking toward a plane that’s parked on the tarmac, carrying her own suitcase. I never actually saw her walking with her suitcase. But she didn’t like entourages. Of course, she would have them periodically, but she was very independent and liked to travel quietly and without a big fuss. It was her style. How old were you when your grandmother died? Do you remember that time? She died on November 7, 1962. I was 23. I remember visiting her at her New York apartment and in the hospital. She was so ill and immobilized that I think she didn’t want to continue. Life was no longer meaningful to her. I remember most vividly her funeral. It was a powerful and moving occasion. Presidents Truman, Eisenhower, Kennedy and Mrs. Kennedy were there, as was Vice President Lyndon Johnson, and other heads of state. She is buried in the Rose Garden at Springwood with my grandfather. We thought of Springwood as a family home, but by then it had become a National Historic Site. It was strange to see velvet ropes placed in front of all the rooms. I was, with special permission, able to go up the third floor where we, as kids during the war years, would be banished to the care of our nannies and nurses. We were living in Seattle when my father went off to World War II. My grandfather, whom I called PaPa, telephoned my mother and said, “Sis (his name for her), I wish you and Johnny would come here to live. I want you to be my right hand person.” None of his closest advisors—Louie Howe, Harry Hopkins—were there any longer. I remember the train trip across the country. I remember playing on the south lawn of the White House, the Easter egg hunts, even having a visit from the Lone Ranger and his horse Silver. Silver was there too? You never told me that! Yes. Silver was there. They brought him in a trailer. He got out and the Lone Ranger got on Silver and—I may be imagining this—I actually got to ride Silver! It was in some ways a wonderful time, and also a very lonely one. I didn’t really have much of my mother. She was with her father, the president, almost the whole time. But he was very welcoming to me. I was the only child living in the White House during the war years, and I would be invited into his bedroom in the morning when he was reading his newspapers. The papers would be scattered over his bed. Despite the fact that he was paralyzed from his hips down, his upper body was extraordinarily strong. He would pluck me up from the floor and we’d sit together on the bed reading the funny papers. I remember swimming with him in the White House pool, and playing in the Oval Office–not during important conferences, but when he was working at his desk. His desk was full of wind-up toys that I could reach up and take down to play with on the floor. And I remember my sense of kinship with the White House guards. But it wasn’t all fun. I felt also a sense of puzzlement and loneliness with my dad gone and my mother inaccessible much of the time. Do you remember when your grandfather died? I was actually in the hospital the day my grandfather died—on April 12, 1945.
come to visit, and my grandmother, too. I was getting well and looking forward to going home to The White House. I heard an announcement on the radio that the president had died. I knew my grandfather was president, but I couldn’t put him together with that announcement. A nurse came racing into the room and turned off the radio, thinking that I hadn’t yet heard the news. My mother soon made things clear. I was six years old. At that point my concern was what would happen to the toys I had left in my closet at The White House. When you think about your famous family, and that they seem to belong to everyone, what comes up for you? I hardly know what to think about it. I have such warm memories of them. It has seldom felt overwhelming to me to think of it as an extraordinary childhood. I did sometimes have the sense that there must have been expectations of me as a member of the Roosevelt family—expectations that I wouldn’t be up to. Only in that way was it a shadow inheritance. Now, in my 70s, in the community where I live, many people regard my grandfather as the president they knew better than any other. It’s been a satisfying experience to feel a sense of kinship with them. Do you recall your grandmother advising you that you had a special role to play, or advice on how to live your life? I don’t think she ever spoke in that way. She felt that if I was going to learn, better to learn by example. She surrounded me with her own magic. John Roosevelt Boettiger is a retired professor of psychology and a member of the Living New Deal Advisory Board, as well as editor of Reckonings and President of The Christopher Reynolds Foundation. 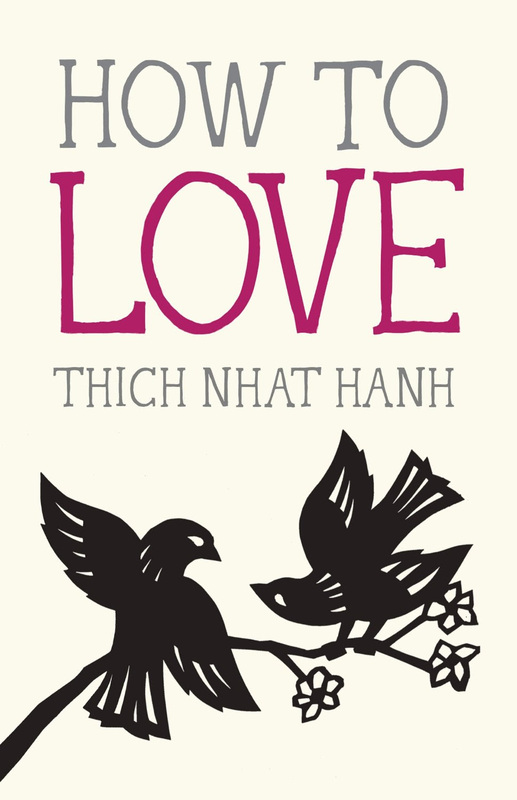 Maria Popova, in today's offering of her fine weekly blog, Brain Pickings, highlights a truly lovely small new book by Thich Nhat Hanh, How to Love, a companion to his equally absorbing How to Sit. I can't think of a better way of celebrating the simultaneity this year and this day of Passover and Easter. 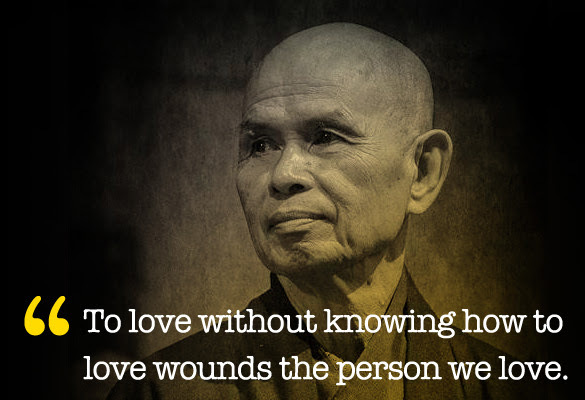 How to Love: Thich Nhat Hanh on Mastering the Art of "Interbeing"
What does love mean, exactly? We have applied to it our finest definitions; we have examined its psychology and outlined it in philosophical frameworks; we have even devised a mathematical formula for attaining it. And yet anyone who has ever taken this wholehearted leap of faith knows that love remains a mystery – perhaps the mystery of the human experience. Learning to meet this mystery with the full realness of our being – to show up for it with absolute clarity of intention – is the dance of life. That's what legendary Vietnamese Zen Buddhist monk, teacher, and peace activist Thich Nhat Hanh (b. October 11, 1926) explores in How to Love – a slim, simply worded collection of his immeasurably wise insights on the most complex and most rewarding human potentiality. Indeed, in accordance with the general praxis of Buddhist teachings, Thich Nhat Hanh delivers distilled infusions of clarity, using elementary language and metaphor to address the most elemental concerns of the soul. To receive his teachings one must make an active commitment not to succumb to the Western pathology of cynicism, our flawed self-protection mechanism that readily dismisses anything sincere and true as simplistic or naïve – even if, or precisely because, we know that all real truth and sincerity are simple by virtue of being true and sincere. If our parents didn’t love and understand each other, how are we to know what love looks like? ... The most precious inheritance that parents can give their children is their own happiness. Our parents may be able to leave us money, houses, and land, but they may not be happy people. If we have happy parents, we have received the richest inheritance of all. If you have enough understanding and love, then every moment – whether it’s spent making breakfast, driving the car, watering the garden, or doing anything else in your day – can be a moment of joy. In true love, there’s no more separation or discrimination. His happiness is your happiness. Your suffering is his suffering. You can no longer say, “That’s your problem." Often, when we say, “I love you” we focus mostly on the idea of the “I” who is doing the loving and less on the quality of the love that’s being offered. This is because we are caught by the idea of self. We think we have a self. But there is no such thing as an individual separate self. A flower is made only of non-flower elements, such as chlorophyll, sunlight, and water. If we were to remove all the non-flower elements from the flower, there would be no flower left. A flower cannot be by herself alone. A flower can only inter-be with all of us... Humans are like this too. We can’t exist by ourselves alone. We can only inter-be. I am made only of non-me elements, such as the Earth, the sun, parents, and ancestors. In a relationship, if you can see the nature of interbeing between you and the other person, you can see that his suffering is your own suffering, and your happiness is his own happiness. With this way of seeing, you speak and act differently. This in itself can relieve so much suffering. The remainder of How to Love explores the simple, profoundly transformative daily practices of love and understanding, which apply not only to romantic relationships but to all forms of "interbeing."